David and Penny Shaw are confident people. Meeting them for the first time, you sense that they are sure of themselves and that they are sure of what their aerospace design and manufacturing company, Flying S Inc., can do. And what Flying S can do is impressive. It has designed, engineered and produced a variety of parts for prototype aircraft projects, including those for space projects and the defense industry. The firm’s ISO 9001 and AS9100 certifications attest to the shop’s prowess in this field. To be sure, there is no cockiness behind this self-confidence. The Shaws, a husband-and-wife team, make decisions based on experience, careful study and prudence. They do not take unnecessary chances. This pattern is evident in the history of Flying S, which the Shaws founded in 2001 on their family farm in rural Illinois after first gaining years of experience in the aerospace industry. Flying S started fabricating its own designs with advanced equipment, including multi-axis CNC machines, on site once it was clear that this development would give the company tighter control over quality and lead times. In 2012, the design and manufacturing team of 15 moved to a new facility across the road after the original location, a “house-barn-hangar,” was out of room for additional manufacturing processes and new, but essential, machines. A similar pattern exists in how the Shaws have aggressively expanded the range of the company’s manufacturing capabilities. From three-axis CNC vertical machining centers (VMCs) to multitasking machines with simultaneous five-axis milling, bar-fed lathes with live tooling and extensive lights-out operation, the manufacturing side of the business has moved steadily from one advanced process to another once it mastered each step on this growth path. Again, the key has been to play it safe, but always be ready to move to the next level as soon as possible. In fact, the theme of risk mitigation plays out in the most important aspects of running the aerospace manufacturing arm of Flying S. You can see it in the company’s approach to programming CNC tool paths, managing cutting tools, designing workholding fixtures, hiring and training its programmers/machinists and other shopfloor functions. In many ways, Flying S’s CAD/CAM capabilities are at the core of these efforts to manage risk while preparing for bold growth, so they deserve special attention. This strategy has paid off. A new building expansion in 2016 gave the team more room to grow and develop. Flying S now has more than 70 people in its workforce of designers, engineers and manufacturing technicians. It has 26 CNC machines, the next likely to be a Haas UMC 1000 palletized five-axis machining center, which will be one of the first of its kind installed in the U.S. market..
Today, Flying S is able to fabricate a range of products including carbon-fiber-composite aircraft wings, intricate molds and machined parts in aluminum and aerospace alloys. “Our goal is to take a project from the design concept to a finished, painted product entirely in our facility. That way, we can ensure quality and efficiency,” Mr. Shaw says. For customers, he believes, choosing Flying S helps them minimize the risk in product development, prototyping and manufacturing. Flying S is located in Crawford County, just across the Indiana border in Illinois. Palestine, Illinois, (population 1,400) is 5 miles to the north. Vincennes, Indiana, is 20 miles south, but across the Wabash River, which forms the border between the states. From the outside, the 75,000 square-foot facility is rather plain; it is unadorned except for the 10-foot-wide company logo. Across the two-lane roadway, bordered by an ordinary country fence, is the Shaw farm, which has been in the family since the 1700s. When David and Penny Shaw started Flying S, they decided to return and locate the new business there. Striking out on their own as founders of an aerospace engineering and consulting firm was a natural move for the Shaws because their work experience prepared them well. David Shaw had been involved in aircraft design and production at Cessna Aircraft (Wichita, Kansas) and in composites manufacturing at Scaled Composites (Mojave, California). Penny Shaw had a background in business management and company development. Meanwhile, the farm continued to operate as a profitable and environmentally sustainable producer of beef cattle. In fact, the company name, Flying S (the S is for Shaw), is represented by a logo that intentionally features a traditional branding iron design for a letter with wings, but in this case, they resemble both aircraft wings and cattle horns. From the start, the Shaws intended to design and build aircraft using advanced composite technology. However, because businesses in the nearby communities supported a workforce with skills in machining and metalworking, their first step into manufacturing was buying a well-used, knee-type milling machine. Venturing into composites came later, when skills for working with composites could be developed in house. By then, Flying S was off the ground with a team of creative and dedicated craftsman as the flight crew. When Flying S made the move to its new facility across the road, one of the people who came along was Peter Bowman, a young machinist who brought his extensive CNC machining and programming knowledge with him. Still in his 20s at the time, Mr. Bowman was a graduate of the Machine Trades Tool & Die Advanced Manufacturing program at nearby Vincennes University (where his father, Doug Bowman, has been teaching manufacturing curriculum for more than 25 years) and was transitioning from a 3-year Master’s Apprenticeship Program at the Haas Automation factory in California. He was hired in 2010 because of his familiarity with a broad range of CNC equipment, his connection to Vincennes, and proficiency with Mastercam CAD/CAM software, which is used extensively both at the University and Flying S.
Mastercam (from CNC Software Inc., Tolland, Connecticut) was an appropriate choice for Flying S because the modular nature of the software enabled the company to acquire the level of capability that was required at the time. Starting with basic 2D and 3D programming, the shop expanded its programming tools to accommodate multi-axis systems, including lathes with live tooling and machines capable of simultaneous five-axis contouring. With Mr. Bowman as the team leader, the Flying S staff of “programmer/machinists” was also growing during this time. By 2017, he had 12 individuals with this combined title on board. Most were Vincennes graduates. “We are a small team, and we can pivot quickly. We prefer not to outsource. If there is something to be learned, we prefer to bring the intelligence, the infrastructure and the equipment in house and learn how to do it ourselves,” Mr. Bowman says. Each team member writes CNC programs and operates the equipment, so they are familiar with how changes in programming strategies affect manufacturing outcomes. Mr. Bowman explains that, as a group, they are committed to systematically pushing the capabilities of the equipment and software (within safe limits) and sharing what they have learned with one another so that they can support company growth. For example, when a process plan for a part is being developed, details about each operation and their exact sequence are recorded and added to the company’s manufacturing database. This database includes the toolpath files and related tool libraries generated in Mastercam, as well as setup instructions and operational notes. With combined programming and machining skills, the shopfloor team is especially effective at creating efficient part plans and sticking to them. No time is wasted on guesswork or reinventing procedures. Optimized Material Removal. For example, the shop team spends substantial time programming and cutting molds used for making carbon-fiber-composite airframe structures for commercial and military customers. These free-form shapes can be very intricate, requiring as many as three to four million lines of code, and they can run unattended on CNC equipment for as long as a week at a time. Oftentimes the team is tasked with producing one of these molds every other day. Generating these programs must be an efficient operation, and the resulting programs must remove material efficiently as well, Mr. Bowman explains. For moldmaking, Flying S relies on tool paths incorporating Mastercam’s Dynamic Motion technology, which constantly maintains the chip load recommended by the cutting tool vendor for safe, yet optimal, removal rates. Mr. Bowman notes that the programming software facilitates programming by guiding the programmer to input parameters and select options in a straightforward, almost intuitive, manner. In addition, the tool paths link to one another with smooth transitions so that hand work after machining is minimal. “The tool paths have proven to be so stable that they can be used with confidence for days on end in unattended operation,” he says. He also credits his Mastercam reseller, ShopWare, with careful editing of postprocessors to ensure that outputs to each of the five-axis machines are precisely tailored to the variations in machine configuration or control structure that inevitably turn up. “This is another safety factor that minimizes disruptions or unwelcome surprises on the shop floor,” he says. Safe Moves. Mr. Bowman emphasizes that machining strategies should be as efficient as possible, but they must also be safe. Team members rely on both toolpath and machine simulation to protect valuable workpieces and equipment. “Whenever we go to do a large mold, for example, we always use the same tools to rough, and we always use the same feeds and speeds. Even though we might have as many as 12 different guys who would be able to program that particular part, we are always using the same process. Sharing the CAM software’s tool libraries has also been a great risk mitigator,” he says. “Also, we are really careful with how a cutting tool enters and retracts from a cut so that that tool always moves safely within the machine envelope. Everyone follows the same basic approach: no unexpected moves as a tool indexes to the next position. And we verify tool paths extensively in Mastercam, so as a result, tool collisions or spindle crashes are very rare,” he reports. “A lot of times we’ll actually run unattended, even on parts that we have never run before. We feel that confident in our CNC programs that we can to hit ‘cycle start’ and let the job go. That’s been a significant bonus for us,” Mr. Bowman concludes. CAD Model Prep Tools. “The ability to manipulate solids within the CAM software has been a real help. It enables us to do more on the shop floor without involving engineers or designers. This eliminates waiting and duplication of effort, and it keeps the work moving forward,” he says. A good example is that they can use the software to automatically “fill” holes in a mold design, so that tool paths to machine contours are based on a smooth, continuous surface in the model. Holes are later restored for drilling in subsequent operations. Another example is their ability to extract geometries to create a model for designing and machining soft jaws or fixturing components that match the geometry. “These design tools certainly make us more self-sufficient and proficient at programming and machining,” Mr. Bowman says. Probing. All CNC machines at Flying S have Renishaw probes, and more than a third of the programs incorporate in-process gaging and tool-breakage detection. 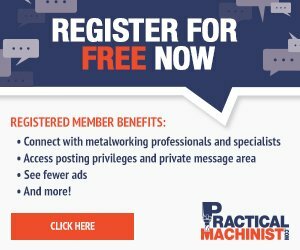 “These are practices that add to the safety of unattended machining,” Mr. Bowman says. Likewise, Mastercam’s 3DGage arm-type measurement systems are used in the shop and the programs for these are also written within the same programming environment. Carbon-Fiber Trimming. Mr. Bowman notes that staying within the same programming environment is like eliminating setups on the machine tools. “Programmers don’t have to shift their thinking from one system to another or pass jobs to other programmers who work in a specialized or dedicated programming system,” he says. That’s why the recent Mold Plus plug-in for Mastercam was especially welcome. It enables the shop to quickly create programs for CNC edge trimming carbon-fiber parts on a machining center instead of by hand. Trimming is necessary because these parts consist of multiple layers of carbon-fiber material that are pressed together and cured in an oven. Frays, loose fibers and excess resin usually remain along the edges of cured parts. In the past, manual trimming resulted in significant labor input, not only for the trimming operations, but also later in assembly because manually trimmed components are less accurate and more difficult to fit with mating parts. Mr. Bowman explains that with the plug-in, a programmer can go around a part model and click on the edges to be trimmed. Because the software has solid-model “awareness,” it can tie the selected edges together to form a continuous tool path. The cutting tool can bypass the edges not included and move to the next set of edges for trimming. To run a trimming program, a simple fixture supports the part on the bed of the machine with access to all trimmable edges. It is not uncommon for the shop to trim hundreds of parts a day using both three-axis and five-axis VMCs. He reports that today, Flying S can machine a complex unmanned aerial vehicle (UAV) flight component out of carbon fiber and have it fit a part made several years ago perfectly. “Our ability to trim complex composite structures with CNC gives us the continuity we need for flight parts during a long-term project. CAM software that helps us do trimming reliably is vital ,” Mr. Bowman says. Most business owners will admit that one of the toughest challenges is finding and hiring the right kind of people for the workforce. Mr. Shaw says that Flying S is no exception to facing this challenge. One of the main reasons Flying S has been able to find and develop a capable and loyal workforce is that Vincennes University is nearby. The university is part of the 2,200-school Haas Technical Education Center (HTEC) Network, which Mr. Shaw describes as “an amazing industry- and education-led initiative that promotes and supports excellence in education on CNC machine tools and related CNC ancillary equipment, software and educational materials.” This program has been a source for many of the shop’s programmer/machinists. This connection to Vincennes University is especially strong because of the link between Flying S’s Peter Bowman and his father, Doug Bowman, HTEC director for Vincennes University in Southwest Indiana. He has been with the school’s Business and Industry HTEC center since its establishment in 2011. Prior to that, Mr. Bowman spent 26 years as the lead CNC instructor in the university’s School of Technology. He oversees all programming in the department, including Right Skills Now – CNC Machining, HTEC teacher training and incumbent worker training. First offered in 2013, Right Skills Now—CNC Machining was established to fill the need for skilled CNC machinists, as well as to help unemployed veterans get on their feet and back into the workforce. It is a combination of about 25 percent machining theory and 75 percent hands-on training for eight hours per day, five days per week, for 15 weeks. Mr. Bowman has been using Mastercam in his classrooms and labs since 1997 because he saw it as the most widely used CAD/CAM system in industry. Students first learn the basics of CNC mill and lathe programming, then setup and operations, with the goal of gaining immediate employment in a shop. “They really need to get on the job and get some experience first before they can really excel with programming software. Once on the job, they get comfortable doing a wide variety of setups and part machining. Then, they can return to VU for incumbent training classes, and go back and apply their new skills immediately by programming their own parts,” Mr. Bowman says. This synergy between technical schoolwork and on-the-job training has been especially vibrant at Flying S, Mr. Shaw observes. For example, almost all of the programmers and machinists on the Flying S shop floor are graduates of either the Right Skills Now–CNC Machining or the Precision Machining Technology program. Peter Bowman at Flying S knows that they are well-prepared to jump in and begin work. This takes out much of the risk of hiring these graduates for the shop’s blend of programmer and machinist positions. The connection with Vincennes University also helped Flying S make the shift from vertical milling to a more efficient process on an automated lathe with multitasking features. For some shops, such a transition can be problematic because missteps during the move prove costly and disruptive. With technical assistance from the university, Flying S made this passage smoothly. It started with a recent project involving the manufacture of a family of 20 different lightweight aircraft fittings. Made of aluminum, these small, clip-like parts are inserted into the carbon-fiber wings to hold them together and adhere to the fuselage. The company originally made the parts on a vertical mill after sawing blanks from barstock. Each part required three setups and many operator interventions to machine all sides. Flying S reached out to Mr. Bowman at the school to discuss possible solutions to the problem. It was quickly concluded that they could run the parts on a lathe with live tooling and an attached bar feeder. Because all parts could be machined from 3-inch-diameter barstock using the same tooling, this approach could automate the process. At the time, Flying S did not have a Y-axis lathe for live tooling on a turret, but the university did. “We scheduled a couple of days of training and Peter and I took one of the actual parts to use as an example. We programmed it, set up the machine and ran a sample part—it worked great,” recalled the elder Mr. Bowman. The Shaws then invested in a Haas ST-30SSY lathe that is similar but has a larger chuck bore than the Vincennes machine, as well as a bar feeder. The investment proved to be a sound one. Two of the Flying S programmers returned to Vincennes for the three-day Mastercam Lathe Design and Toolpaths class. All the commonly used 3D-programming options are available within the software for programming for this kind of machine. Doug Bowman reports that “on the third day of the class, we finished up a little early, so I had those students program one of the prototype drone parts and they ran their programs on the lathe. After completing the class, they are now programming and overseeing the machining of this entire family of parts back at their shop,” he says. He adds that seeing that kind of successful and confident advancement at a local company is gratifying. Of course, his son Peter at the shop has more to say about the move to a multitasking lathe in a production cell. He notes that almost all parts produced on this machine are fairly similar and part of a family of fittings . Reducing setups is a major benefit of the lathe’s inherent multi-axis capabilitybecause it lessens the risk of errors and misalignments in each part handling and enables the machine to run for long periods unattended. Producing 180 or more fittings overnight is now a routine pattern. “There was no doubt about making the investment in this technology,” he concludes. Someday the Shaws would like to design and manufacture their own product line. In the meantime, they intend to continue honing their manufacturing management skills, adding new equipment and building a cohesive and capable workforce. Peter Bowman already has ideas for how the machine shop can rise to the challenge of future growth. “We’ll need more automation, greater efficiency and more multitasking machines with larger capacity. The production cells we have in place will have to be enlarged or replicated. I can see a lot more multitasking machines like ones in place now to maximize the skills of our machinists,” he says. “Continued success for any business lies in its ability to analyze the risks ahead and prepare to tackle them with careful study, resolve and a can-do confidence,” he concludes. Peter Bowman (right) and Ben Parish check the drawing of a torque-tube fitting to be machined on a Haas UMC-750-2, part of a six-machine cell dedicated to five-axis machining. Currently, all CNC machines at Flying S are from Haas Automation. The main machining area of Flying S’s manufacturing complex houses several cells of similar machines. This row of three-axis machining centers is adjacent to the five-axis machining cell. Because all the machines have the same brand of CNC (Haas) programmed with the same CAD/CAM software (Mastercam), the shop’s team of machinist/programmers is adaptable, flexible and capable of operating virtually any machines assigned to them. Owners David and Penny Shaw founded Flying S as an engineering company whose manufacturing solutions for aviation and aerospace components are supported by complete machining and fabricating capabilities. Many molds for composite aircraft components are produced from aluminum billets on this Haas GR 712 gantry router operated by Spencer Hose. Confidence in the CNC programs for these mostly one-of-kind molds enable the shop to machine them in the unattended mode. Jonathan Simpson and Barrett Robbins prepare a multi-ply layup of carbon-fiber sheets to form one side of a vertical stabilizer for a supersonic R&D project. All the aluminum molds for Flying S’s composite components are machined in house. Jake Blankenbeker inspects an aerospace component in a fixture that was created using a 3D-printed version of this part (the inset shows this part and its additively manufactured counterpart). The shop uses this articulated arm with a touch-trigger probe to collect data points that complete the measurement. This arm (Master3DGage) and other CMMs follow programs created in Mastercam, thus keeping inspection in the same CAD/CAM environment as part modeling and CNC programming. Before the aerospace part on the left was machined, a 3D-printed version (yellow) was used to create fixtures and other tooling to speed the overall production process. Flying S has a Markforged additive manufacturing unit for 3D printing. Kyle Haas runs a vertical machining center to trim cured carbon fiber parts. A software plug-in that enables a multi-axis trimming programming to be created quickly was the key to moving away from time-consuming, less accurate manual trimming. Michael Buchanan inspects the supports of this checking fixture for composite aircraft wings using a laser-based CMM. Results are immediately displayed and compared to the CAD model viewable on the large-format monitor. Before Flying S invested in a multitasking machine with a turret on a programmable Y axis, Doug Bowman at Vincennes University showed how complex parts could be produced from barstock using programs created in the lathe portion of Mastercam. Subsequently, the shop purchased a similar machine with a larger spindle bore.